The stunning town of Annecy is the perfect spot for a short cycling break in France. Let the Practice Bicycle experience give you a dream bike tour escape with this 2 night flexible package. What could be more perfect than the best bike riding of your life in the most stunning location in Europe – Lake Annecy French Alps? Our Annecy Weekend Bike Trips combine the best cycling in the world with a stay in one the most beautiful towns in France. Discover the perfect balance of riding and relaxation in a true cycling paradise. 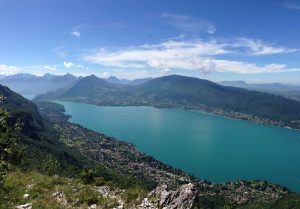 We have developed over 100 cycling routes in and around Annecy each with amazing scenery and ideal for all riding abilities and you’ll get to experience the best of them with this first-class guided weekend bike tour. When your short of time and looking for all the quality, detail and first class service taken care of with a weekend bicycle tour, packed with everything that you could wish for the perfect experience. Pick your dates, relax in total confidence and save all your energy for Riding and Relaxing. 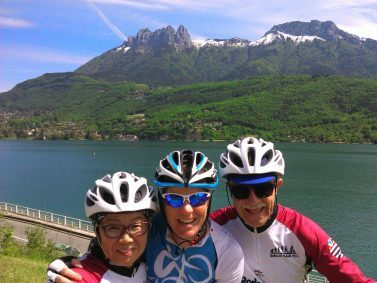 You will be amazed at the pleasure, sense of achievement and thrills of your fully supported cycling break, brought to you with all our local knowledge and experience of living and cycling for 20 years in Annecy, Cycling Paradise in the French Alps. Want to make it a holiday? Also look at our world-famous Annecy Bike Trip to turn your perfect weekend into the cycling holiday of a lifetime! Tour Type Our weekend bike trips provide the ideal opportunity to escape for a 2 night cycling break. Set in the most beautiful cycling location in the world, we guarantee you will experience the very best of cycling and France on our weekend tours in the French Alps. Activity Level Because our tours are always based at a single location with an endless choice of ride options, we can tailor the routes to meet your riding requirements and cycling abilities. Available Packages All our prices are AUD $ per person based on twin share accommodation. If you require individual rooms, a single room surcharge will apply. Season European summer months are perfect with tour dates listed below. If you want to travel on different dates, don't hesitate to contact us! Optional Extras Quality carbon road bikes shimano compact 50,34 x 11,29. 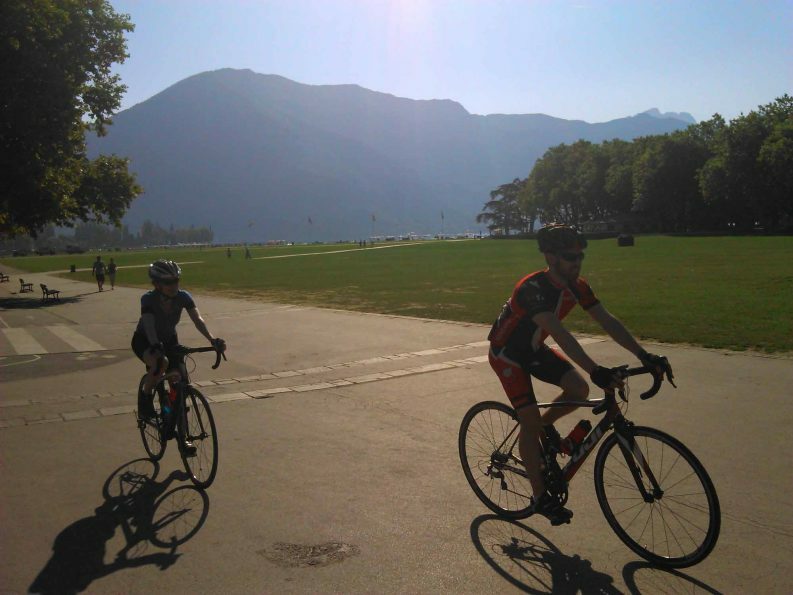 Accompany your cycling partner on the 2 day Annecy Weekend Bike Tour, whilst they pedal this paradise, relax in the comfort of the support vehicle and escape together! Experience and share all the same sights of this unique region of France, with regular meeting points throughout the choice ride routes. Whilst cycling can be a pleasurable challenge for some, your pleasures will be more of the cultural and discovery of this regions history and traditional way of life, from artisanal local products to the joy of relaxing at a Restaurant/Café in the country! 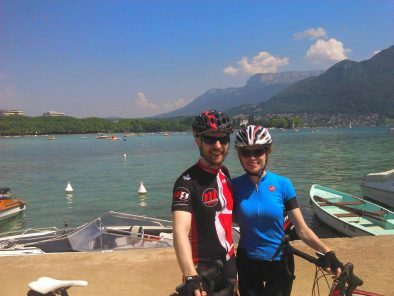 My wife and I participated in an Annecy Weekend Bike Tour with PRACTICE BICYCLE TOURS, it was spectacular! From the supplied hire bikes that were delivered to our hotel door to planning perfect routes/speeds based on our comfort, the team certainly delivered on their promise to show us the French Alps! We would definitely recommend them to anyone looking for a stress free Alps experience! We run our Annecy Weekend Bike Trips between May and September. Below are all our scheduled small-group departures for the Annecy Weekend Bike Trip. To enquire about joining our tours, click the “Enquire Now” button next to the tour date. 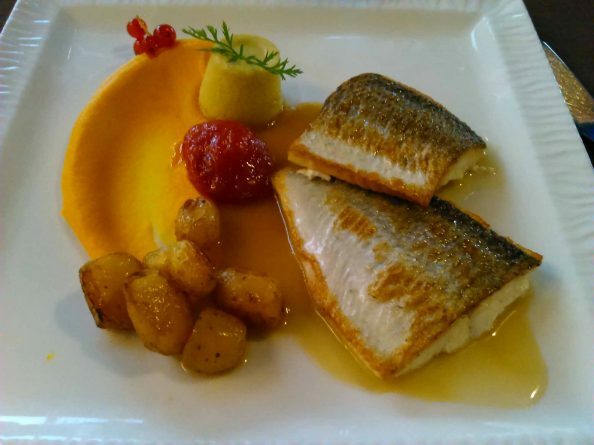 Don’t miss the Annecy Weekend Specials! If you want to travel on different dates, don’t hesitate to contact us about arranging a private Annecy Weekend Bike Trip! Arrival Day in Annecy and the beauty of Lake Annecy, start your dream break with the amazing panoramic views of the French Alps and the first of the best two rides of your life. Experience Cycling Paradise like no other as we share one of the many choice rides at your pace, take it easy or bring on the challenge it’s your choice all the way. This evening relax and enjoy the charm of Annecy with only two nights… don’t waste a second! 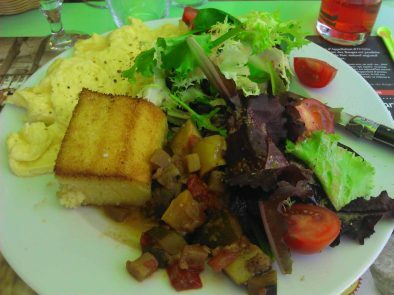 Enjoy a full and leisurely Breakfast or if you prefer take an early start before we ride on the mythical roads of the French Alps, classic and breathtaking, seen on the TV and picture postcard perfect now ridden by you. It’s your short cycling break so ride as much or as little as you like with all the support and guidance available from the No 1 cycling team in Annecy the French Alps. Practice Bicycle choose proven quality, air-conditioned Splendid Hotel 3* accommodation located in the heart of undoubtedly the most beautiful town in France, Annecy. Annecy is one of the best places in the world to relax and explore – also off the bike! The ‘Pearl in the box’ town often referred to as the Venice of the Alps is the absolute perfect base for classic French Alps cycling and ideal for relaxing and sharing with non-cycling partners. You may choose to wander the enchanting streets, do some shopping or just sit by the lake and admire the spectacular views and watch French life pass you by. The team can assist you in choosing from the many superb restaurants, bars and salon du teas in the home of Practice Bicycle, Annecy. 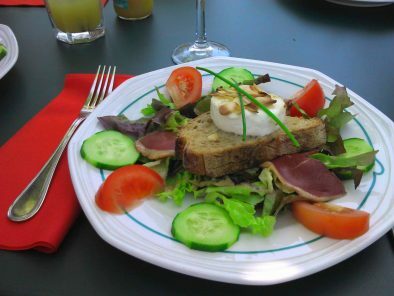 Spend your evening enjoying a lovely meal just like a local, ready for your next day full of new sights, adventures and opportunities in the French Alps. Bon soiree! Whether you have years of cycling experience or are just new to the bicycle, you will be thrilled with the cycling on offer during the Annecy Weekend Bike Trip. As long as you love cycling, this trip is for you! 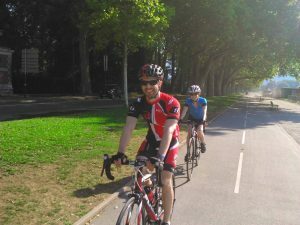 Each cycling route during your Annecy 2 day bike tour will be tailored specifically to your bike riding ability and experience, so you can have a challenging ride or a comfortable ride – the choice is yours. All rides start and end in the same place, so there are no targets to make each day and you can not be left behind. We love a challenge as much as we love cycling. The team at Practice Bicycle has a history in professional bike racing and coaching, so if it’s a challenge you are looking for, we can definitely find just the right rides for you. 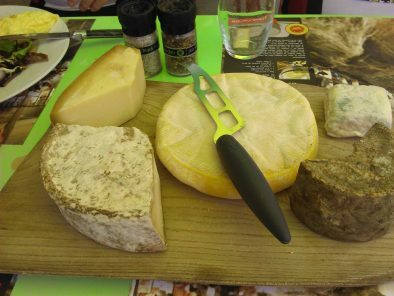 After all, the area around Annecy is home to over 20 classic Cols! If you are looking for more than a 2 day challenge to improve your cycling, then consider our winter and summer training camp weeks. On each of our Annecy weekend tours we tailor each ride to your cycling requirements and riding ability. 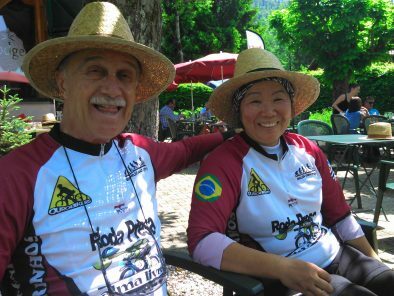 Practice Bicycle has developed 100+ routes around Annecy for riders of all levels with over 20 years cycling experience in the Rhone-Alps of France. To get an idea of what sort of rides you will be doing, have a look at a sample of our rides in Annecy. As a Non Cycling guest you experience all the sights & delights at a leisurely pace from the comfort of the support vehicle, catching up at regular intervals throughout each day with your cycling partner and our off the beaten path cafe stops together. Our local support team will share with you culture and villages on route beyond what any guide book with show you! With so little time and so much to see and do whilst visiting Lake Annecy the ‘Venice of the Alps’ take your pick from culture to water sports to shopping to Gastronomy to nature…or just sit & watch French life at it’s best! No maps, no getting lost, no keeping up with the bunch, just lose yourself with the perfect pace, your pace.